So recently I started organizing my kitchen. That in itself is a huge undertaking but what I realized is that I have way too much stuff. I mean, I’ve got old baking dishes that I haven’t used in years and a collection of empty wine bottles that rivals my local bar, so I started wondering what in the world I could do with all of these things that I don’t use but really don’t want to throw out. Some of my old kitchen items are hand me downs from generations of grandmothers and I just can’t part with them. So instead, I compiled a list of 50 different ways that I could repurpose those items and I wanted to share it with you. You know by now that repurposing is one of my most favorite pastimes. Honestly, if I can turn something into something new then I’m all for it. I love upcycling and taking things that would otherwise be considered trash and turning it into something wonderful and new. 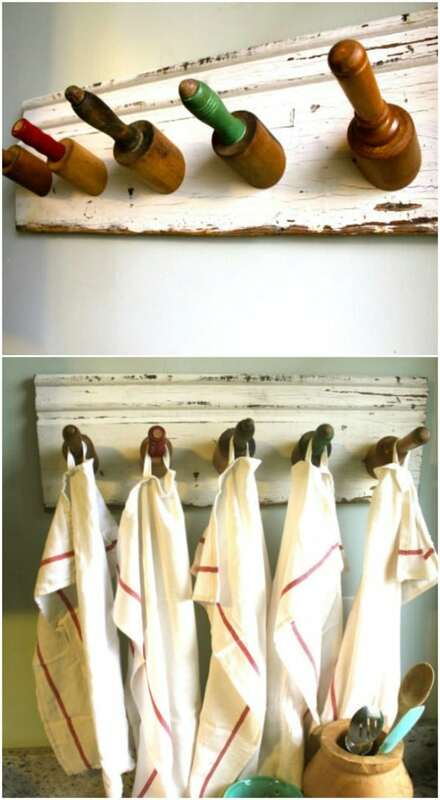 So along those lines, I’ve found these wonderful ways that you can turn your old kitchen items into exciting new things. 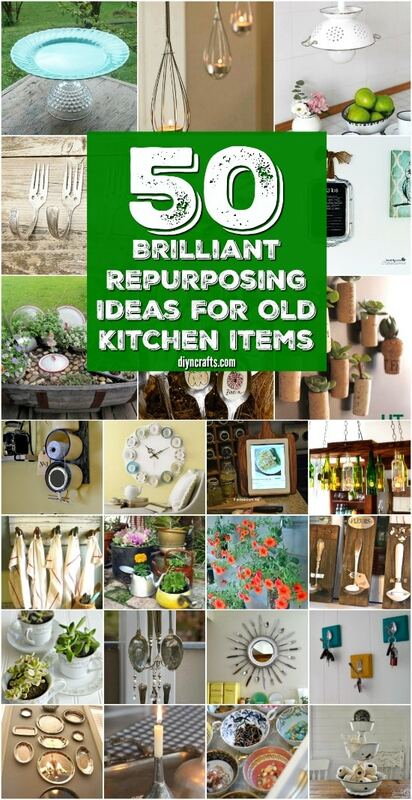 If you love repurposing and upcycling, this is definitely the project list for you. If you want a more specific project list, like one just for pots and pans then you should check out my 25 repurposing ideas for pots and pans. There are some wonderful and fun projects in here, as well. From artwork to lighting and even some really cool clocks, this list has something for just about everything in your kitchen. If you don’t have old vintage items that you need to repurpose, most of these items can be purchased from the Dollar Store for just a few dollars each or you could check out flea markets and yard sales and get old dishes and other kitchen accessories for a steal. You just have to figure out which project you want to do so that you’ll know what items to buy. If you want to discover more upcycling ideas head over our repurposing category. So, if your kitchen is like mine and is way overstocked with things that you just never use, you can find wonderful ways to repurpose them in this list. These are some of the most creative ideas that I’ve ever seen and I can’t wait for you to try them all. You can turn old baking tins or new ones for that matter, into beautiful artwork for your walls. Just take those tins and pin them to your wall. This is a great idea for lighter weight items and you can even incorporate some newer pieces into the mix – the Dollar Store has some wonderful faux metal baking and serving tins for just a dollar or so each. 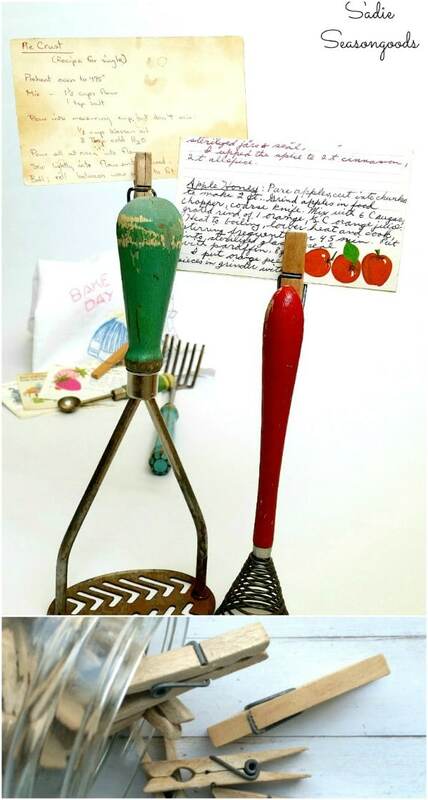 Just create a design and fill your wall with beautiful vintage kitchen items. 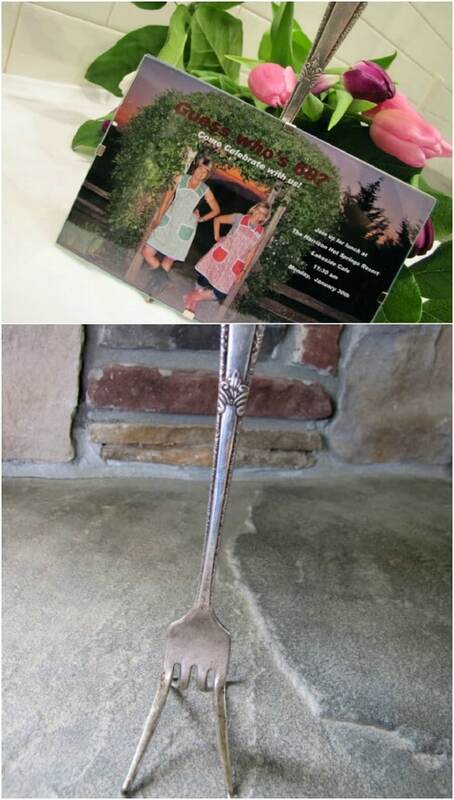 You can turn old silver forks into beautiful easels to display your favorite photos and artwork. These are better for smaller frames, unless of course you have a huge metal fork that you want to use. You just have to bend the tines to hold the frame and that’s about it. This would be a beautiful way to display family photos in the dining room and the easels only take a few minutes to create. Spoons can be bent into beautiful hangers for your hanging plants. You can do this with spoons of any size, although I would base the size of the spoon on the size of the plant that you are hanging. You don’t want a heavy plant on an old teaspoon. Those vintage silver serving spoons would be perfect for this and will add such beauty to your porch or garden area. Just bend the spoon and then screw to a solid surface and you’re all done. Just like you can bend a spoon to hang a plant, you can bend a vintage ladle and turn it into a beautiful tealight candle holder. Or, if you prefer, you can leave the ladle intact and just secure it to a wood plank or other solid surface. These make beautiful sconces when they’re attached to wood and will instantly add that great rustic look to any room. I absolutely adore a good mason jar project and this one is one of my favorites. 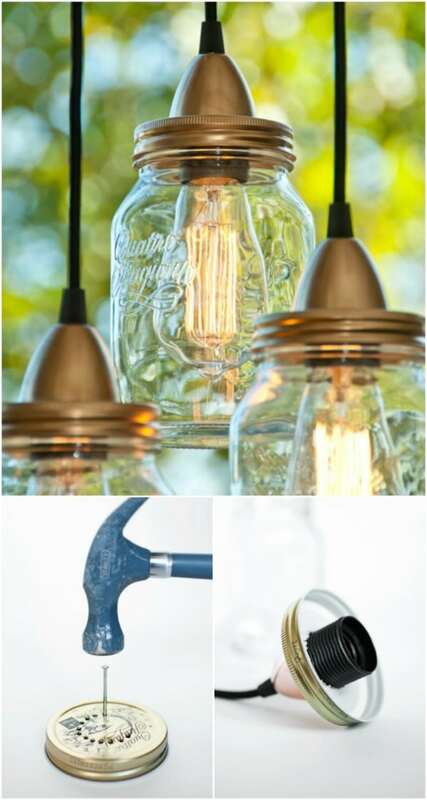 You can turn that old jar into a beautiful light fixture and it doesn’t even take that long. Decorative jars are great for this project so if you have a stash of old jelly jars that are quart sized, you can use those to make a beautiful light for your kitchen or breakfast nook. There’s not a lot of technical or electrical work required, either. An old wine glass, goblet or anything similar that you have on hand and a vintage plate can be used to make a lovely cake stand. If you have a set of dessert goblets or glasses that have been broken and you want to preserve the last one in style, this is a great project to try. You just have to glue the plate to the bottom of the glass and that’s it. Then use this to display all those wonderful baked goods that you love to create. An old serving tray can be turned into a beautiful chalkboard message center with just a little paint and a few minutes of your time. This would be perfect for keeping shopping lists or appointments handy. Just spray the tray – the center of the tray – with chalkboard paint and you can even stencil in a calendar base or a things to do list. If you’re like me, you have several empty wine bottles sitting in the kitchen just waiting on the perfect DIY project. 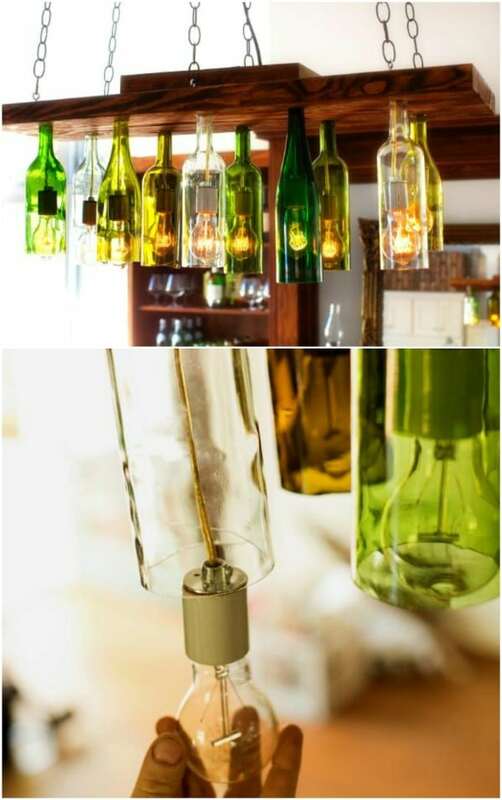 Well, here it is – you can turn those old wine bottles into a beautiful chandelier for the kitchen, dining room, or even the porch. You’ll have to cut the bottles so this is one of those projects where you’ll need to be very careful. When it’s finished, this chandelier is absolutely breathtaking and will add elegance to any room where you hang it. If you have a rusty old cheese grater that you just can’t use anymore – don’t throw it out. Turn it into this neat little pencil holder instead. There isn’t even a lot of work required for this project and you get an adorably vintage pencil holder that you can attach to the wall so you always have it where you need it. 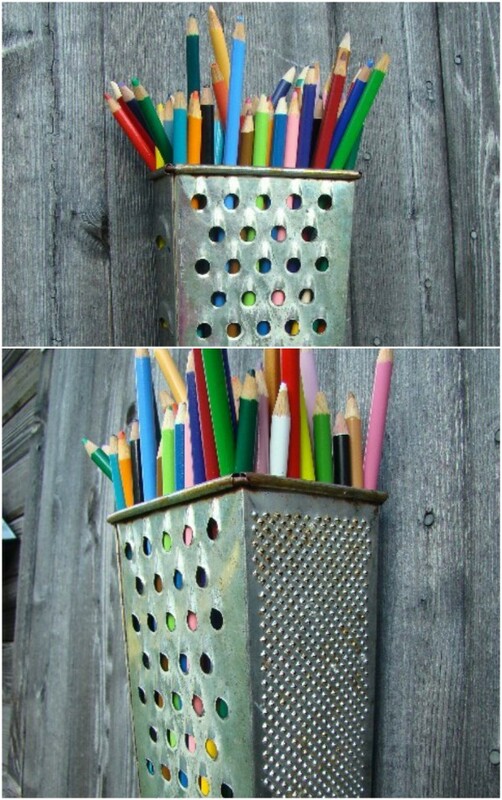 This would be perfect for craft rooms or kids’ rooms, to keep their pencils on hand. 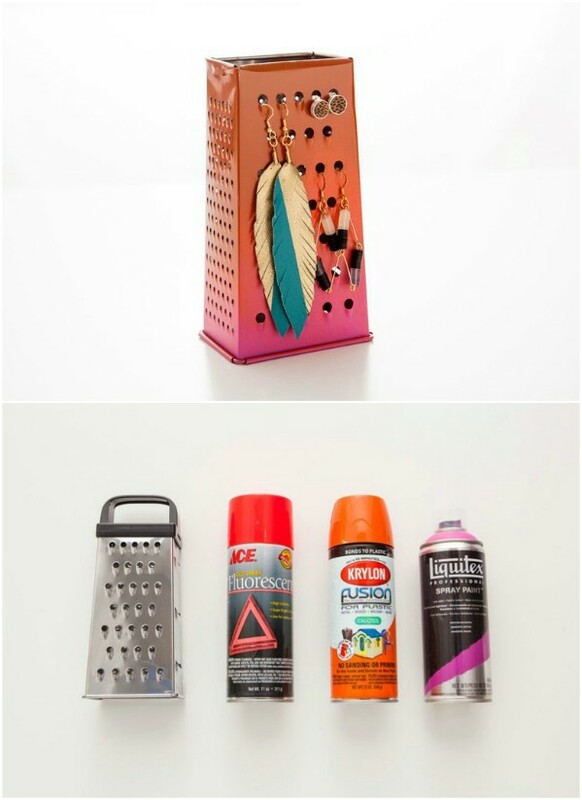 Here’s another great idea to put that old cheese grater to great use. Turn it into a beautiful earring holder! This is a great way to keep those earrings that you wear regularly right there where you need them. Plus, it has a wonderful vintage feel to it, don’t you think? You can have this ready to hang your favorite earrings in about five minutes and the earrings fit perfectly into the holes of the grater. Those old potato mashers and whisks can easily be turned into recipe card holders when you add a clothespin. I have an old wooden handled potato masher that I never use because well, modern days and all. I love the idea of displaying it in the kitchen and giving it new life. You just glue a clothespin onto the handle and then just clip in your recipe card to hold it securely in place. I love these little teacup lights. If you have a few pieces of china that are maybe mismatched or you just don’t use them and hate to see them sitting in the china cabinet unused, you can turn them into these gorgeous lights. How great would these be in the kitchen or dining room? 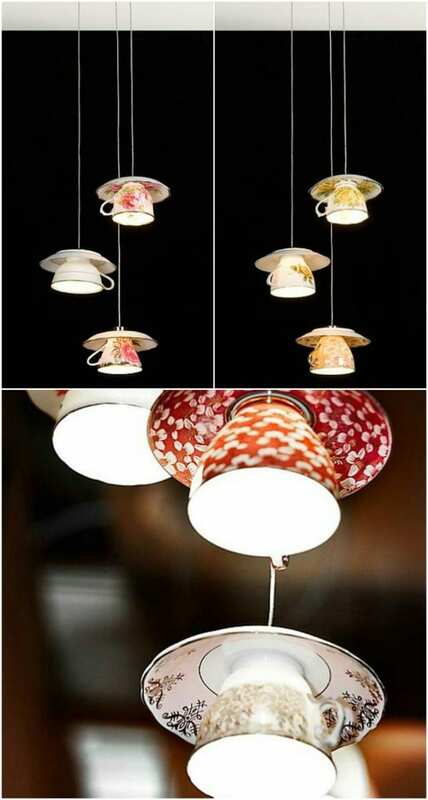 There’s a little work involved, and you’ll need to use a few power tools, but this DIY teacup light idea is definitely worth the extra work. Those old enamel mugs – if you’re lucky enough to have a few on hand – can be turned into an adorable organizer that fits in perfectly with a farmhouse theme. 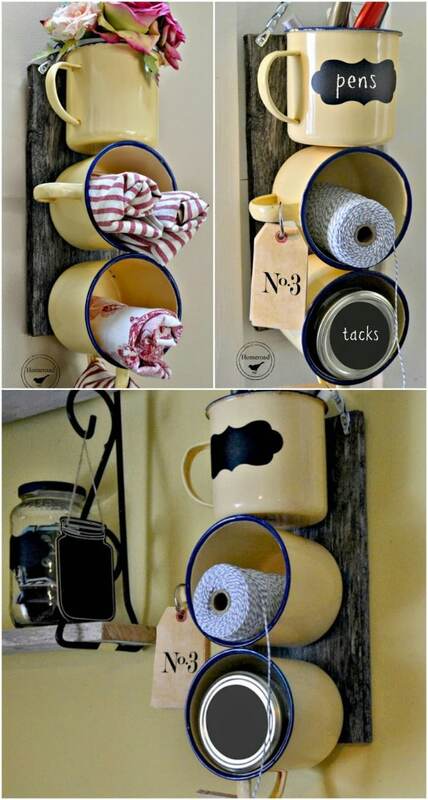 Just drill a hole in each mug and use the hole to affix the mug to a plank or old board. Then, you can use the mugs themselves to organize and store any number of things from soap in the bathroom to craft supplies or even table linens. I have an old metal funnel that belonged to my grandmother and it is one of my most favorite vintage kitchen items. If you have one too, you can turn that funnel into a great candle holder that has a wonderful vintage farmhouse look to it. You just turn the funnel upside down and put a taper candle in the opening. How easy is that? You could go all out if you wanted and add some twine or burlap to really give it a great farmhouse look. You can turn an old wooden cutting board into an adorable holder for your tablet or iPad. If you tend to look up recipes on your tablet – like I do – you know how desperately you need a holder to keep the tablet upright while you cook. 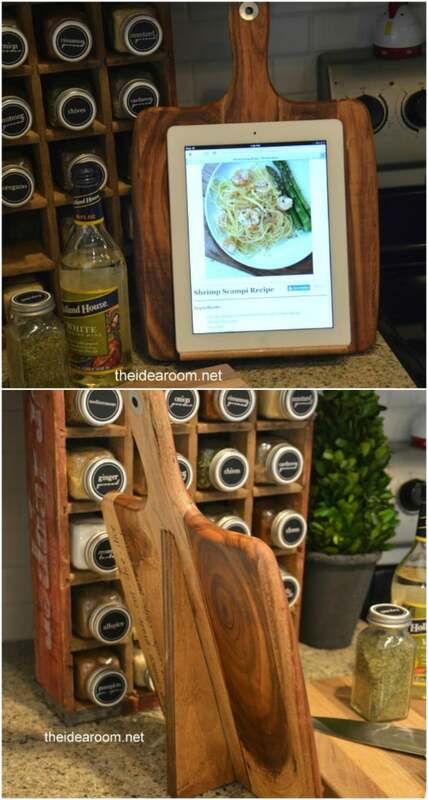 Take that old cutting board and turn it into a great holder for that tablet by just adding two tiny little boards. This would also be great to hold smaller recipe books. 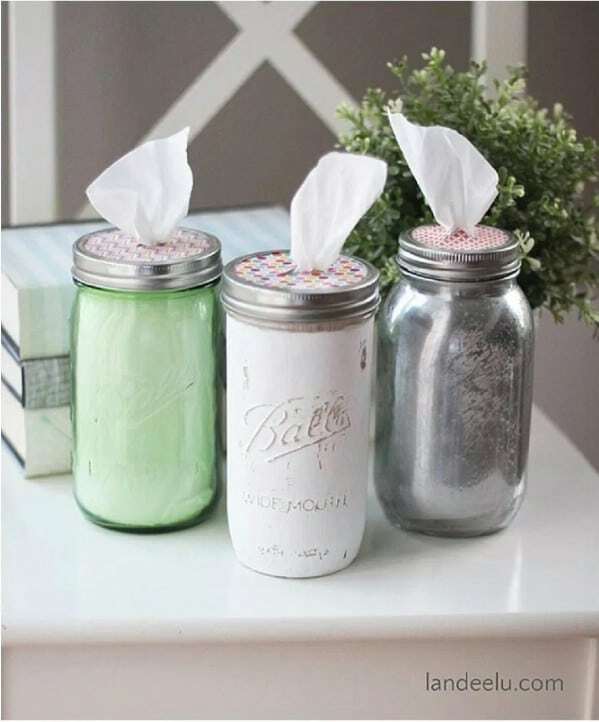 An empty mason jar – or any jar you have on hand, really – can be turned into an adorable tissue holder. I love the painted and distressed look on mason jars and this one is perfect for holding tissues on your desk or dresser. Just decorate the jar however you want and then cut a piece of scrapbook paper to fit the lid ring. Cut a slit in the paper and add your tissues and you’re all done. I love the idea of using an old muffin tin to keep junk drawers organized. This is such an easy project that really doesn’t take any work. You just add the muffin tin to your drawer and then get that drawer organized. The individual compartments are perfect for storing all sorts of things. 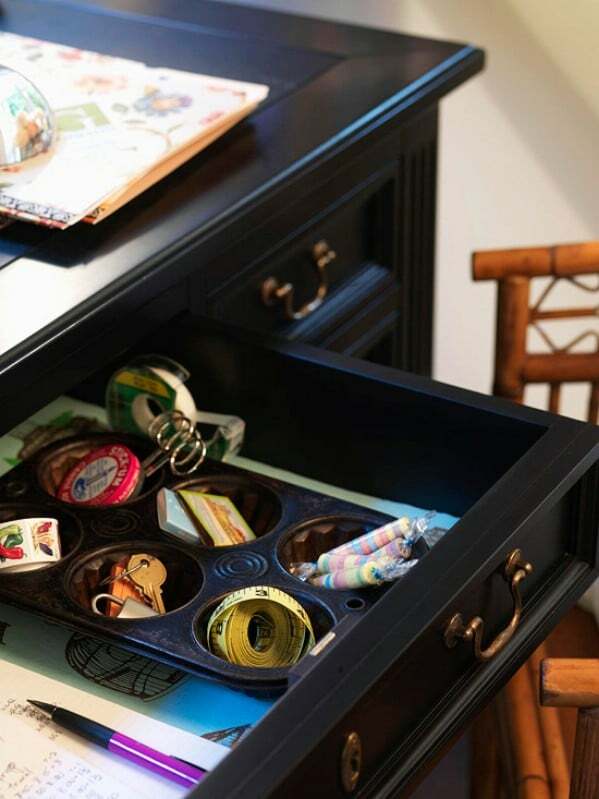 This is a great idea for kitchens, bathrooms, or dresser drawers to keep smaller items from getting lost. 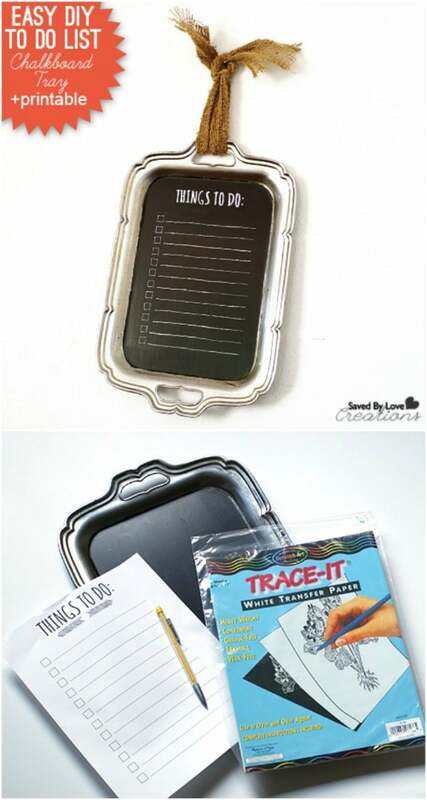 Or use it in a desk drawer for paper clips and other office supplies. When I was younger, I had a bracelet that I absolutely loved. If you remember that old spoon jewelry, you can recreate it pretty easily. Just bend the bottom of your spoon around and you’re all done. 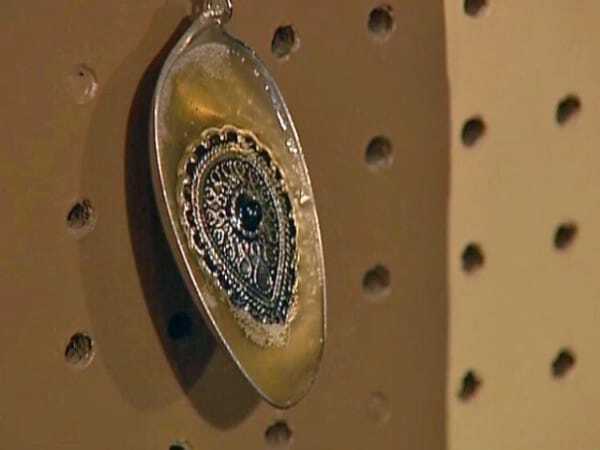 Or, you could create this beautiful spoon pendant that you make from the top of the spoon – the actual spoon part. This is a relatively easy project as well and gives you so much room for customization. 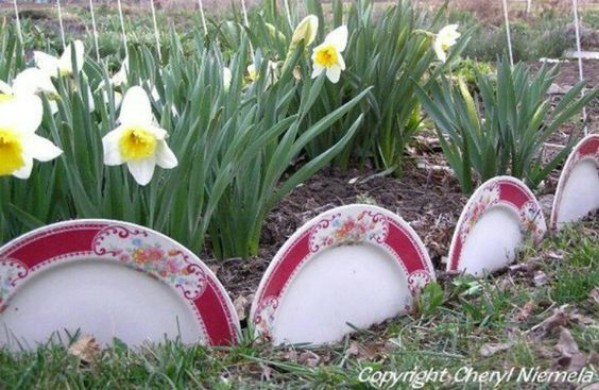 If you have broken or otherwise unused plates, you can turn them into beautiful garden decorations. Use an old matching set to create a mini fence around your favorite flowers or just randomly put the plates between your plants. 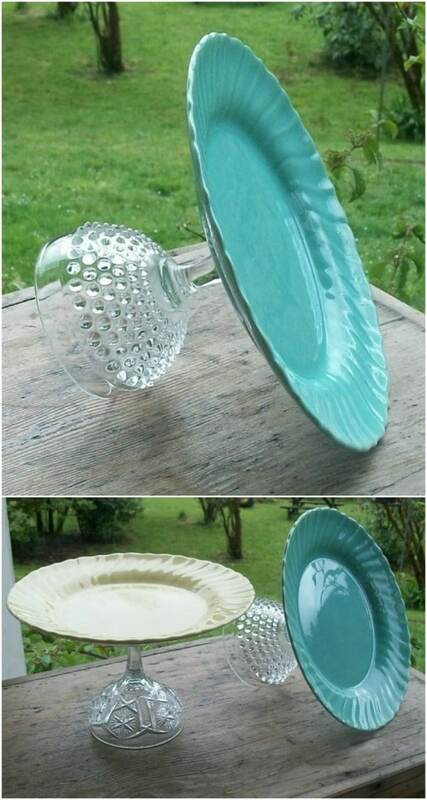 This is a wonderful way to use those broken or unused dishes and to give your garden a little bit of excitement as well. 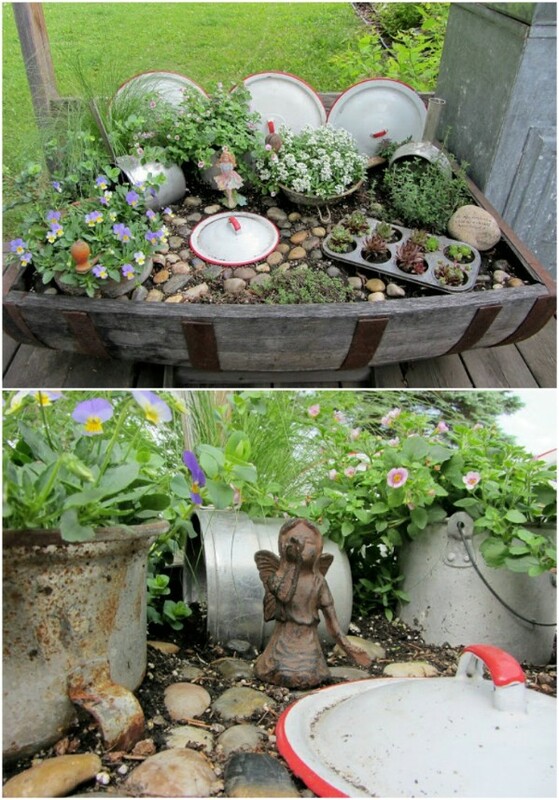 You can also use your old rusty pots and pans to dress up your garden. 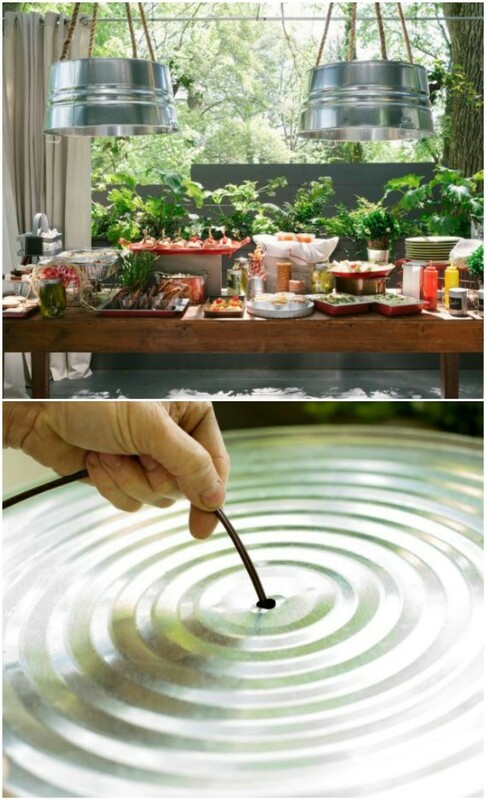 If those cooking and baking dishes just aren’t cutting it in the kitchen any longer, turn them into beautiful garden décor – and you just have to set them in the garden. There’s no real work required here. You can use them to plant succulents and other small plants and then just add your fairy decorations and you have a beautiful kitchen fairy garden. I love this old cheese grater turned message board. This is a neat little board that you can use to hang pictures, hold recipes, or just anything else you want. 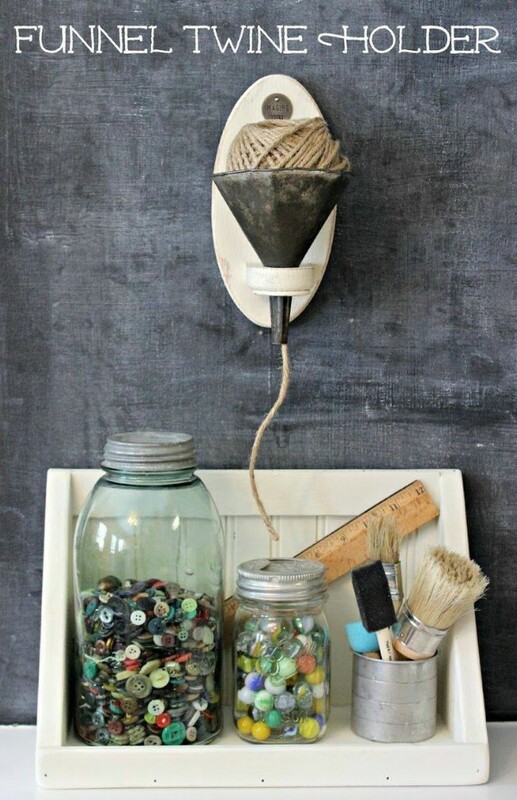 You hang your pictures with fishing line, or you could add twine or burlap if you really want to give it a great rustic country look. I found this one on Etsy for just under $25 or you could give the DIY version a try and make this one yourself. 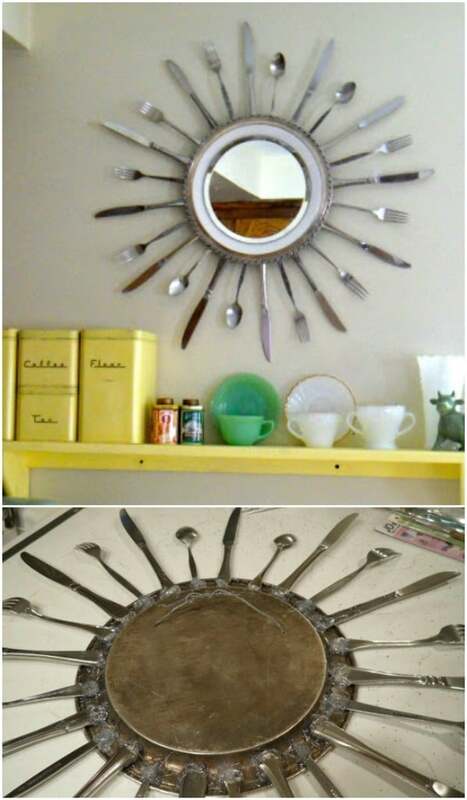 This starburst mirror is fabulous and it’s made from your old silverware. 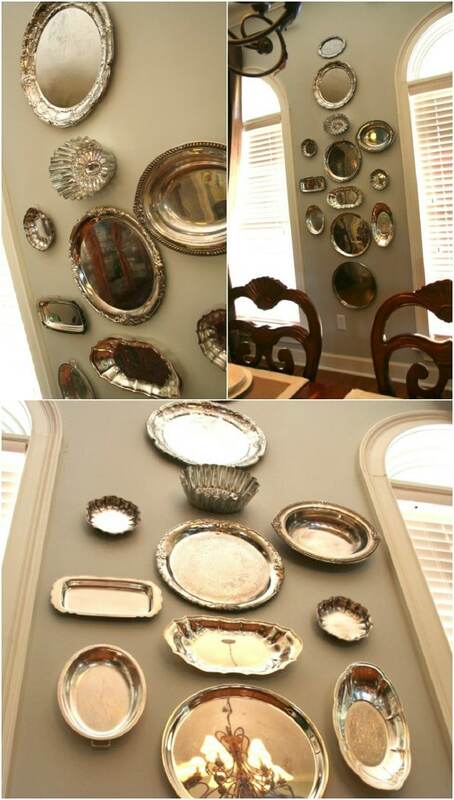 Aside from the silverware, you just need a plate and a small mirrored tray – or a small tray and you could paint it with mirrored paint to give it a mirror look. 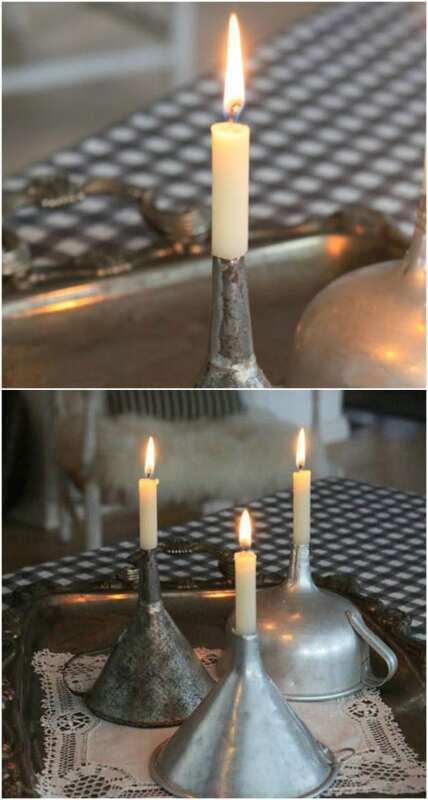 I love the idea of keeping family heirloom silver even if you aren’t using it any longer to set the table and this would be the perfect way to keep and display it. 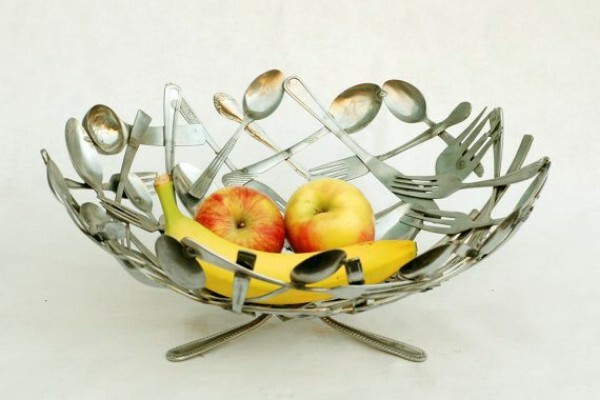 Another great way to use up that silverware is to create a beautiful fruit bowl from it. You’ll want to make sure that you glue the tines of your forks down so that they don’t poke someone. Overall, this doesn’t look like a terribly difficult project and you end up with a beautiful fruit bowl that is sure to spark some conversation from friends and family. 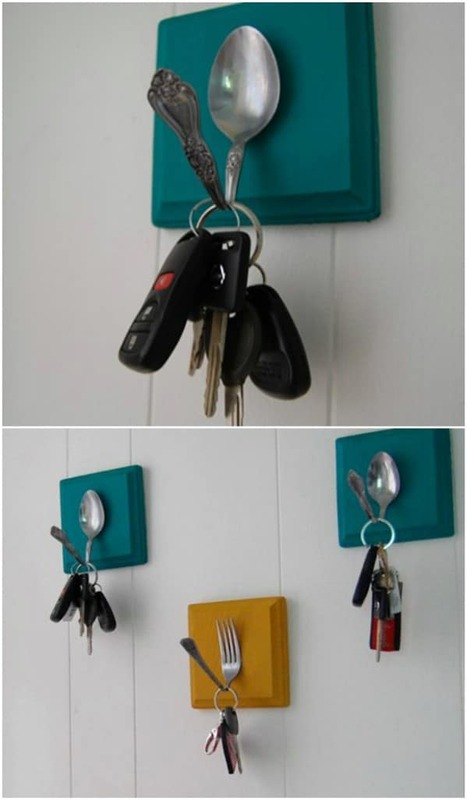 You can also turn silverware into these wonderful hooks for holding keys and all sorts of other things. 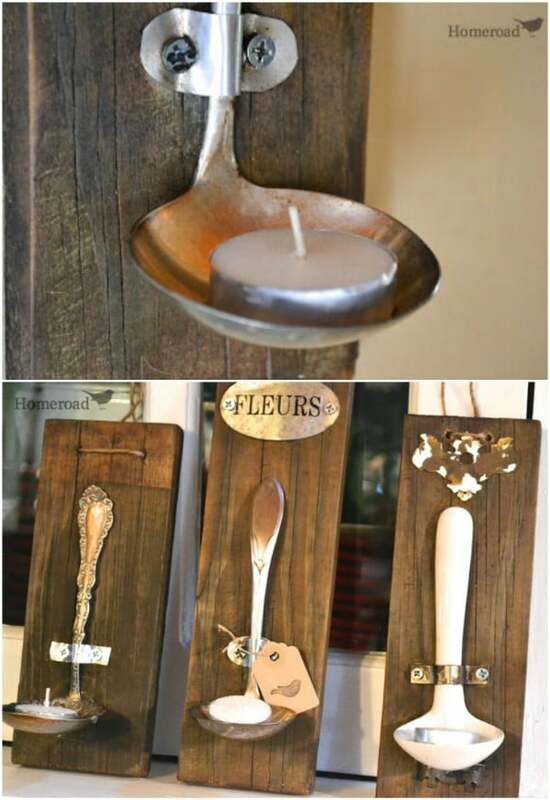 You’ll need a block of wood for each hook that you want to create and then as many spoons and forks as you want to use. Just bend the silverware up a bit and then use Gorilla glue to hold them into place. These are perfect for keeping your keys where you can always find them or they would also make nice jacket hooks. verware that you aren’t using in the kitchen any longer and even add other kitchen accessories that you need to upcycle. Add vintage jewelry, beads, or other items to really dress it up. These silverware chandeliers sell for hundreds of dollars each. I’ve actually seen a couple that were over a thousand, but you can make it yourself with some vintage silverware. The great thing about this is you can get as creative as you want. Make it simple or add jewels and other embellishments to make it really elegant. The basic project is pretty easy – you’ll decide how elaborate it gets. 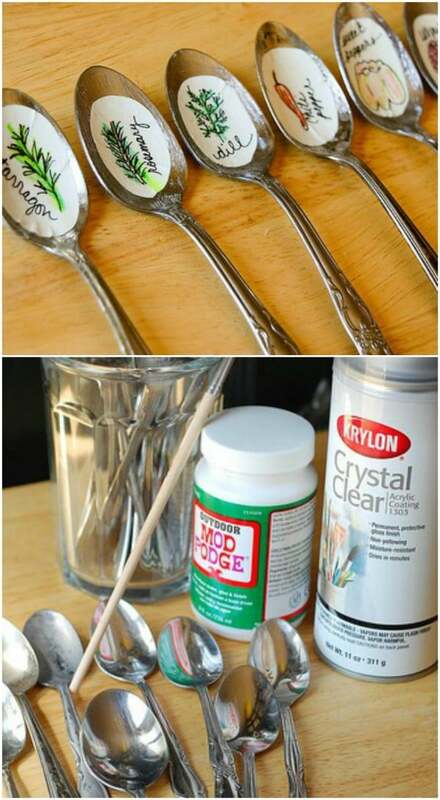 Turn those old vintage spoons into great markers for the garden. These would be perfect for your herb garden or you can use them it your larger vegetable garden if you prefer. I love the idea of drawing out the herb or flower in question and then using adhesive to stick it to the spoon but you could do this in any number of different ways. However you mark them, these spoons are going to be a beautiful addition to your garden. Old rolling pins were cut in half to create these really unique and very farmhouse looking rack. You could use this to hang up your aprons or even as a coat rack inside the kitchen – if your back door is in the kitchen, that is. I love how rustic this looks and it’s such a whimsical rack. I found this one over on Etsy for around $90 but you could make it yourself if you wanted to take the time to do so. 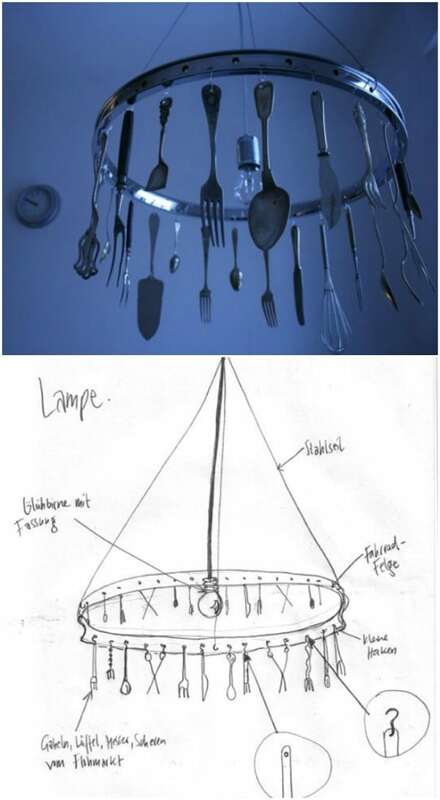 Turn an old metal colander into a wonderful light for the kitchen. This would be a great way to get a little additional lighting on a counter space or you could use it to hang above your kitchen table. It’s a relatively easy project, too. 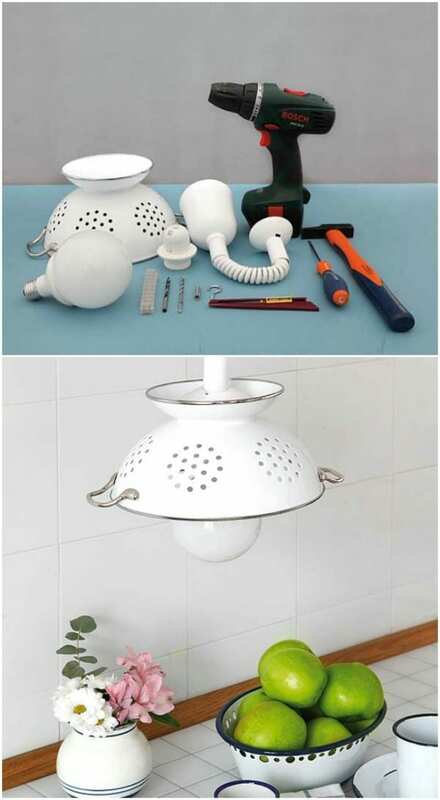 You just have to drill a hole in the bottom of the colander and then add a lighting fixture kit. This is a wonderful way to add some vintage farmhouse charm to the kitchen. 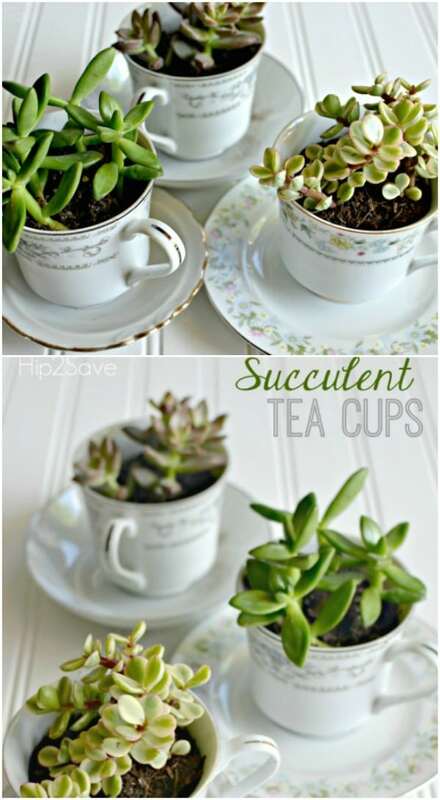 Turn those mismatched or otherwise unusable teacups into beautiful succulent planters. These make wonderful Mother’s Day gifts or gifts for any special occasion. You could also just make them for yourself and display them in the kitchen or in the garden. You just plant small succulents in your teacups and that’s it. You can arrange them to create a beautiful design or just sit a couple on the kitchen windowsill. 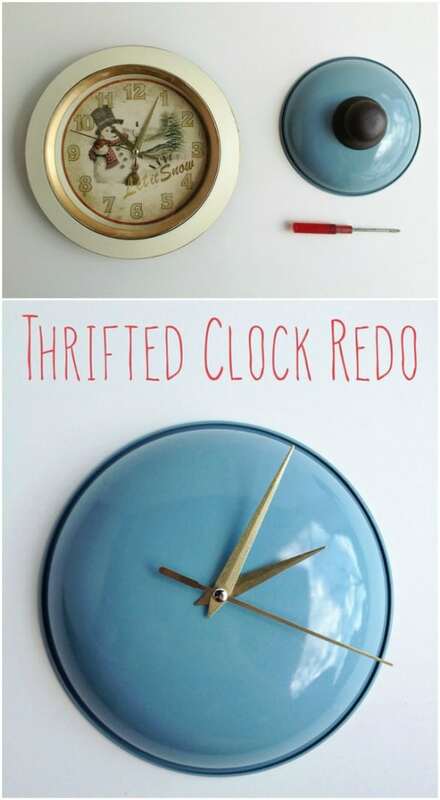 Turn an old lid to your cooking pot into a beautiful kitchen clock. If you’re looking for the perfect clock for your kitchen, this is it. What could be more perfect than an actual cooking lid? You just have to clean it up and add a clock kit, which you can find at any hobby or craft store. Or, just take the clock mechanism out of an old clock that you’re not using any longer and this entire project could be free. Small cutting boards can be upcycled to make these amazing cutlery bags that you can use for cooking out or indoor get-togethers. 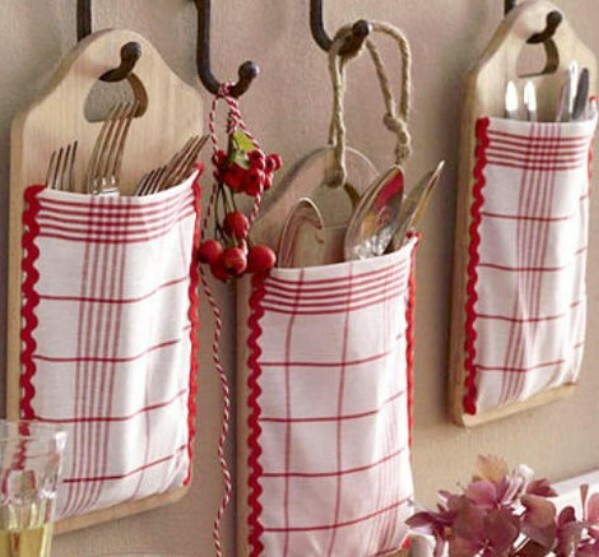 You can even use old tea towels to hold the cutlery in place. This is a really cute project and it gives you the perfect cutlery bags to hold your silverware for any occasion. There’s no sewing required and overall, this one won’t take long at all. 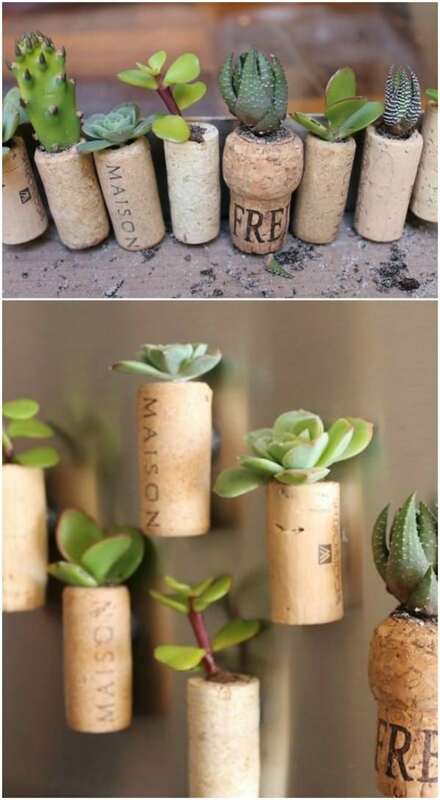 Turn old wine corks into these beautiful succulent planters – you know, after you’ve created something with the bottles. These make wonderful refrigerator magnets and really add some great greenery to the kitchen. You just have to create a small hole or pocket inside the cork for planting and then glue on a magnet to the back. Then add your favorite small succulents and you’re all done. 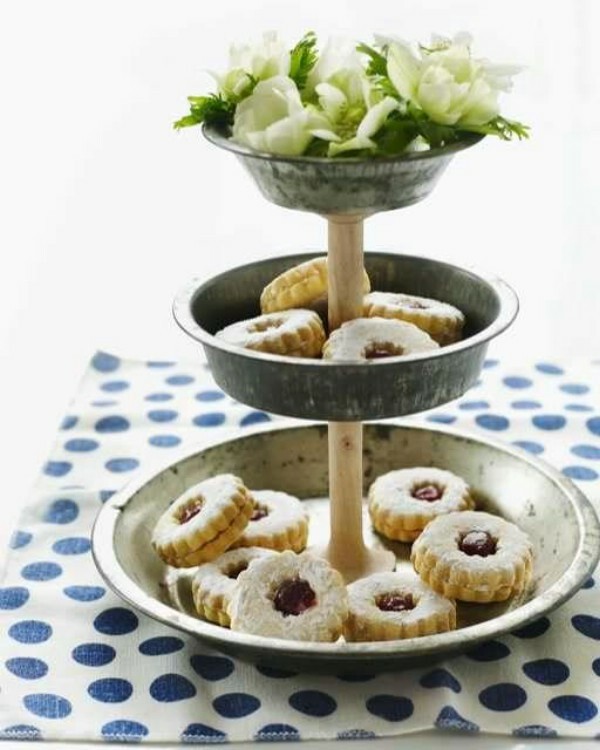 Turn those old tart pans into a new tiered cake stand. This entire DIY doesn’t take long. All you have to do is choose the pans that you’re using, glue them onto a wooden dowel and that’s basically it. You can have this made in about 10 minutes or so and it’s sure to become your favorite stand for displaying your baked goods. I love the simplicity and how easy it is to make. You’ll love the vintage look, too. I love the idea of using old tea kettles in the garden. My tea kettle is one of my favorite kitchen accessories and putting them in the garden would just be heaven. 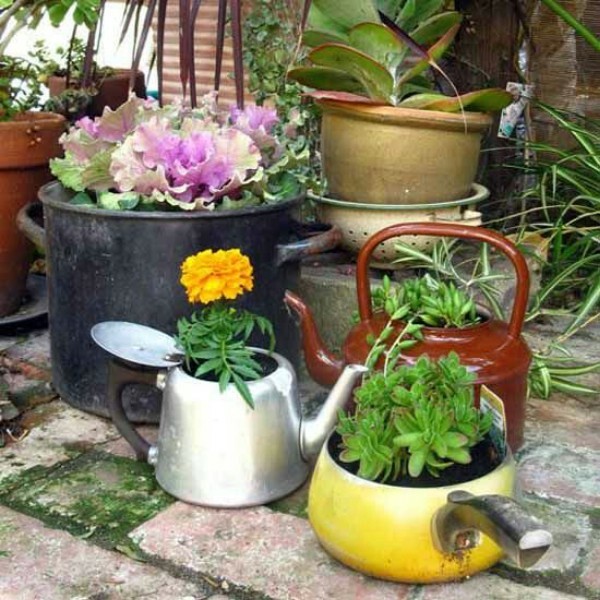 If you have a few old kettles that you aren’t using, you can instantly turn them into planters. Just sit them in the garden and then add your favorite plants or succulents. There’s not even any work to this one. Those old teacups would make wonderful feeders for your feathered friends. 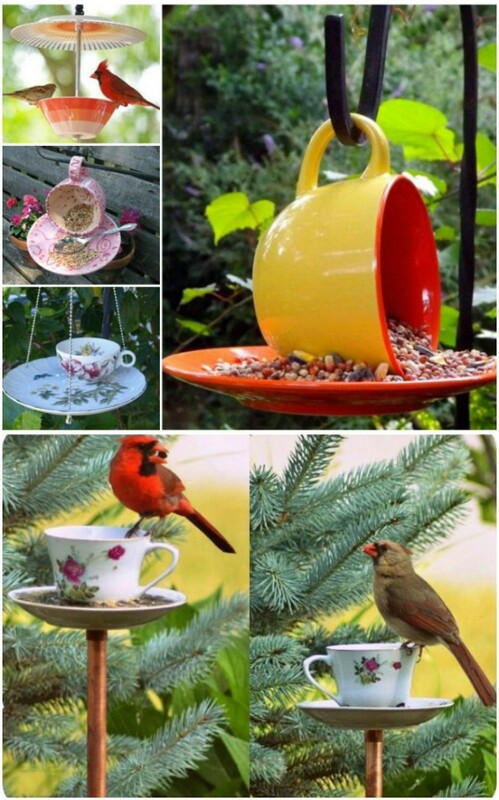 There are a couple of ways that you can turn your old teacups into bird feeders. The most popular way is to glue the cup to the saucer and then add the food to the saucer. You can hang it up by the cup handle. You could also use the saucer as a roof to keep the birds dry and in the shade and add the bird food to the cup – this one is a bit more complicated but the birds will love it. 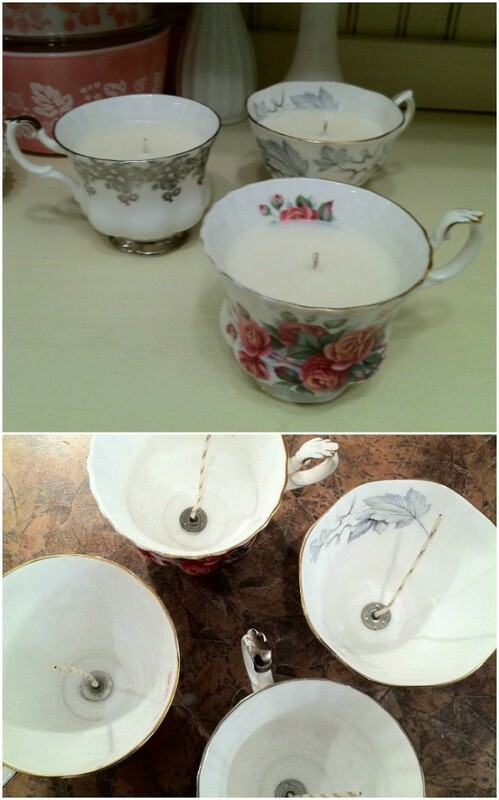 Turn that old teacup into a beautiful homemade candle. These make wonderful gifts for any special occasion and candle making is such an easy and really fun craft. You can choose what scents you want to add and even make your own scent if you want. Or, if you don’t really want to get into the act of candle making, you could simply melt an existing candle and pour it into your teacup to harden. 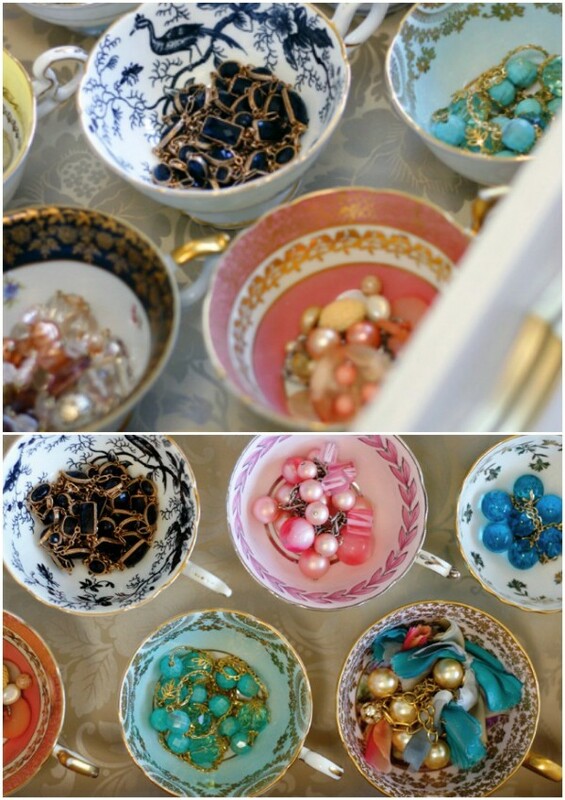 If you have some old teacups and you just don’t know what to do with them, turn them into elegant jewelry organizers. This is another project that really doesn’t take any work. You simply choose the teacups that you want to use and then put them on your dresser for holding your favorite jewelry pieces. If you really want to be crafty, you could glue the teacups to a vintage serving tray and display your jewelry that way. I love these old metal thermos jugs turned into elegant lamps. With a lamp kit that you can pick up at a craft or hobby store you can easily turn those thermos jugs into beautiful lamps. Just add the light kit and a shade and you’re all done. Well, there is a bit more work to it than that, but not much and these make wonderful side table or nightstand lamps and they have such a wonderfully vintage look to them if you use old thermos jugs. Here is another beautiful tiered stand that you can make from those old kitchen items. This one uses two old metal colanders and you’ll need something to join them together, like a wooden table leg or dowel. This is also a really easy project and this bowl type stand would be perfect for holding fruit or other similar items. You could even use old metal mixing bowls in various sizes to create a beautiful vintage looking stand. You can use those old kitchen items to really get your craft room organized. Take this twine holder for instance. It’s made from an old metal funnel – although you could use a plastic one if that’s what you have on hand. Just hang it up on the wall and add your twine. Then pull the twine down through the pour opening and you’ve got the perfect organizer for twine or even ribbon, so you always know where it is and can find the end easily. These vintage silver salad fork hooks are perfect for use as curtain tiebacks or for general hooks that you can hang your coat on. There are so many versatile uses for these and they’re beautiful and elegant with their vintage silver look. The forks are bent so you can easily attach them to a wall or cabinet. 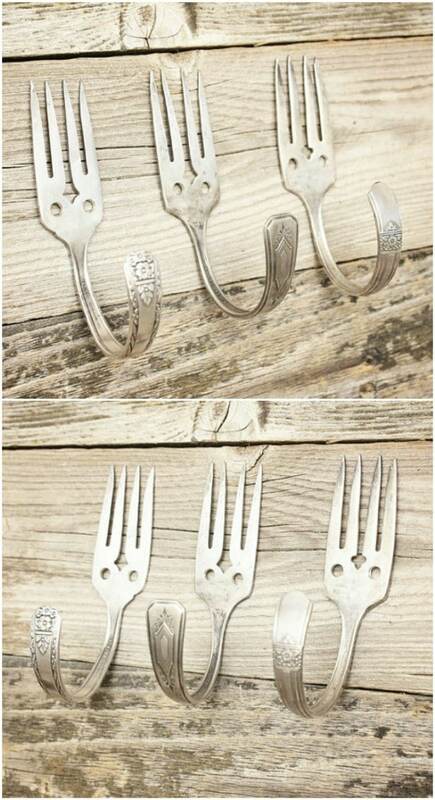 I found these on Etsy and they’re just $24 for a set of three different forks. 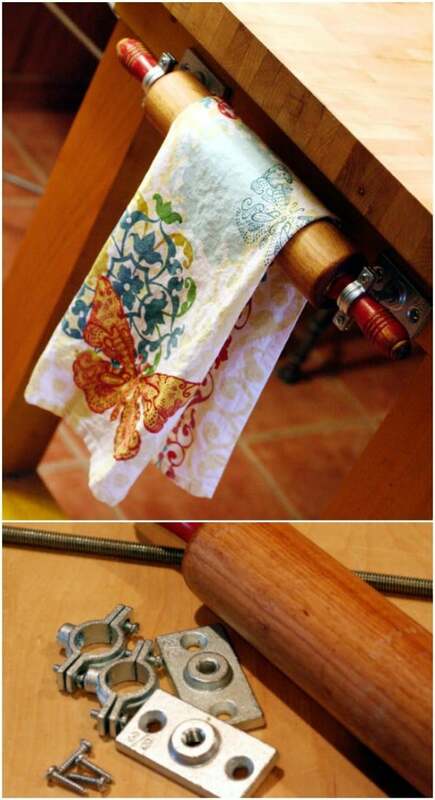 Turn that old wooden rolling pin into a wonderful towel rack for your kitchen towels. I love the idea of having a wooden rolling pin in the kitchen – besides the one that I use for baking, that is. This isn’t even a difficult project and it makes such a huge statement. Just attach it to the side of your cabinet or countertop and you’ve got a wonderful vintage towel rack that really adds some country charm to your kitchen. 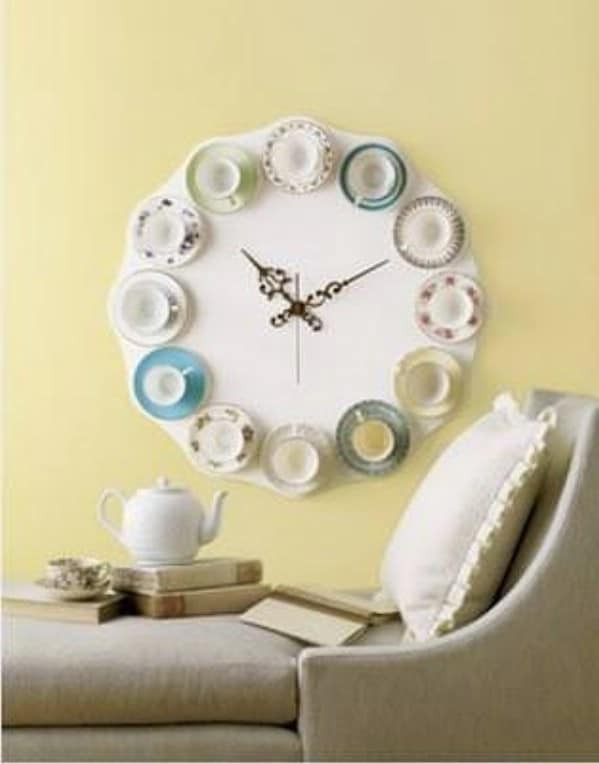 If you tend to spend a lot of time on tea parties – I’ve had two little girls so we’ve done a lot of tea parties – then this vintage teacup clock is a must. You need 12 sets of teacups and saucers and a few other supplies, including a clock kit that you can pick up at your local craft store. This is a simply gorgeous clock that is sure to look great in your dining room or sitting room if you have one. You can turn those old kitchen buckets into these amazing lights that would be perfect for lighting up the patio. You’ll need as many buckets as you want lights and then a few other supplies. You can leave your buckets tarnished to give them a great rustic look or clean them up – or buy new ones – if you prefer a shinier approach to your lighting. Whisks are great in the kitchen for so many things, and they can be used outside the kitchen as well. 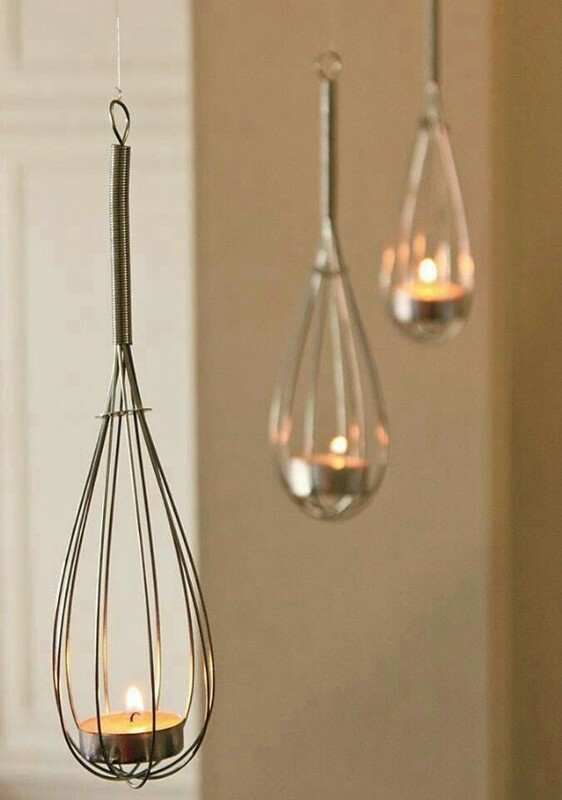 Who would have ever thought that those lovely silver whisks could be used to hold tealight candles? I absolutely love this idea and it’s so easy. Just hang hooks if you don’t already have them, from the ceiling and then hook the whisk handle on. The tealight fits perfectly inside the whisk area. You can turn those unused wine glasses into great little lamps for holding tealight candles or those little battery operated candles. If you do tend to have wine glasses that you never use, this is a great way to give them new life. You don’t even have to do much. Just choose the glasses you want to use and then insert a tealight. You can find so many wonderful little lampshades that will fit perfectly over the glass, making it look just like a tiny little lamp. Wooden spoons are great for marking your garden. You just paint them whatever colors you prefer and add the names of all your herbs, flowers, or vegetables that you want to mark. Paint them really bright colors so that you can always find them and you’ll know exactly what veggies or herbs you are looking at, even before they start growing in. If you don’t have wooden spoons to use for this, you can get an entire bag at the Dollar Store for a dollar. 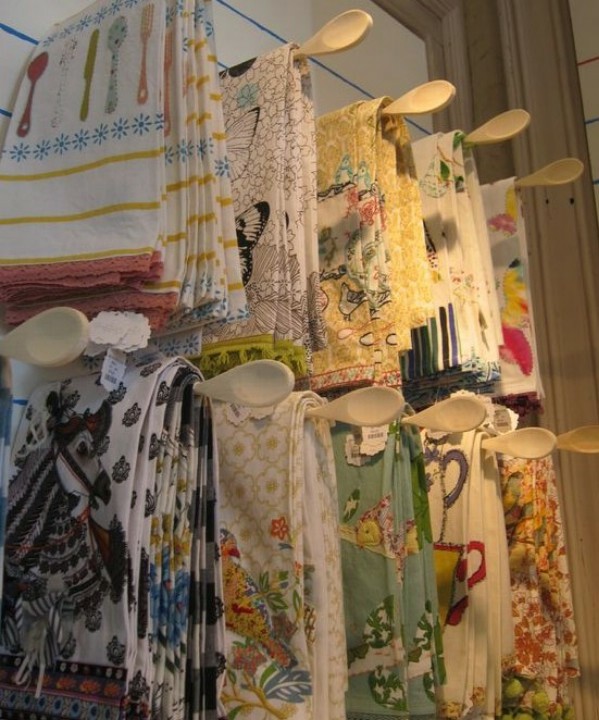 Those wooden spoons can also be turned into this amazing towel rack for holding all of your kitchen towels. This would be great if you build them on a swivel so that you could move the towels out of the way when needed. Or, just drill holes in an old cabinet or board and glue the spoons in the holes to hold your towels. 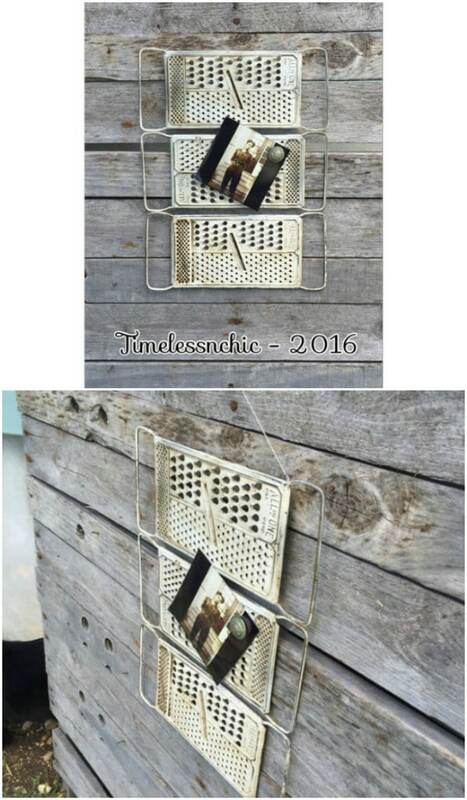 Here’s another wonderful clock idea and one that you can make from old baking pans. 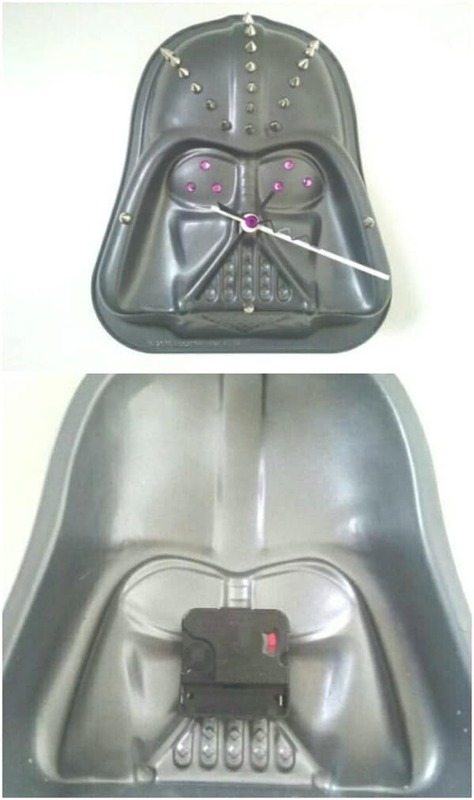 This one in particular is made with a Darth Vader pan but you could make yours from any old cake pan that you have on hand. I found this one on Etsy and it’s just $23, but if you prefer, you could DIY this by just choosing a cake pan and then adding a clock kit that you can buy at your local hobby store. Muy Buenas propuestas los felicito. Adorei. Amo reaproveitamento e/ou reciclagem. Ótimas idéias. Valeu. Inspiring and motivational ideas, will look again before dumping old stuff and keep weather eye in charity shops and boot markets. Thank you.